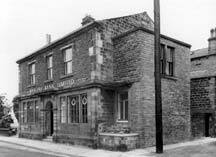 Banking in Mytholmroyd dates back to at least 1872, when the Halifax Commercial Bank opened an agency at 6 New Road. In 1914 the agency was promoted to branch status, the manager also running the Luddenden Foot branch. In 1921 the premises were declared inadequate and so Royd House, Burnley Road  then two dwellings - was purchased for £850 and converted into a new bank which served the people of Mytholmroyd and district for a further 72 years. Over the years the branch has been occupied by several banks including Barclays, who closed it in 1993. The photo, below, pre-dates 1969 when it was Martins. Photo and information kindly provided by Barclays Archive Centre. These Premises Became The Beauty Bank In May 2002.